I’m really starting to make some headway with my craft room. I joked with John that it was going to get a lot worse before it got better… and that was so true. I really thought this would be done in a couple of weekends, but I didn’t realize how badly disorganized I was until I really started getting into the nitty gritty of the stuff that wasn’t seen. I pretty much had to take most everything out to get a real sense of what I wanted where, and I’ve been piecing it all back together slowly and putting new storage solutions in place as I go. 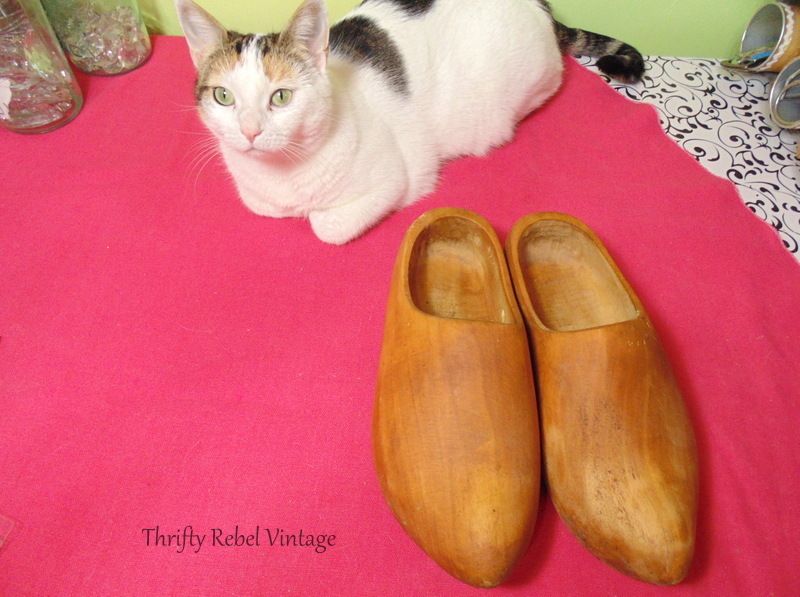 While going through this stuff I found some things that I forgot I had… like these thrifted wooden shoes. Little Miss Pixie was my assistant with this fast and easy project. I had some picture frame hangers so I just nailed them in. Easy peasy. A couple of nails in the wall and they’re up. Some things don’t need makeovers, and I like how the natural wood of these shoes goes with my Pringles can storage. This whole craft room reorganization thing started because I was fed up with my work desk being a constant mess. I’d go in to do a project and have to clean it off and I’d just stack stuff here and there thinking I’d get to it later. Well later came, but much much much later… when it was all a crazy mess. I really want my work desk to be the one thing that stays clear even if the rest of the room goes crazy again, which it better not but I’m not making any promises. lol. Now I can keep the things that I use the most like my scissors, my multi-head screwdriver, pens, pencils, and sharpies handy but off my desk. I thought these wooden shoes were so cool when I found them at a garage sale last summer, and now I think they’re even cooler… to me anyway. I love that I’ll be seeing them every day. 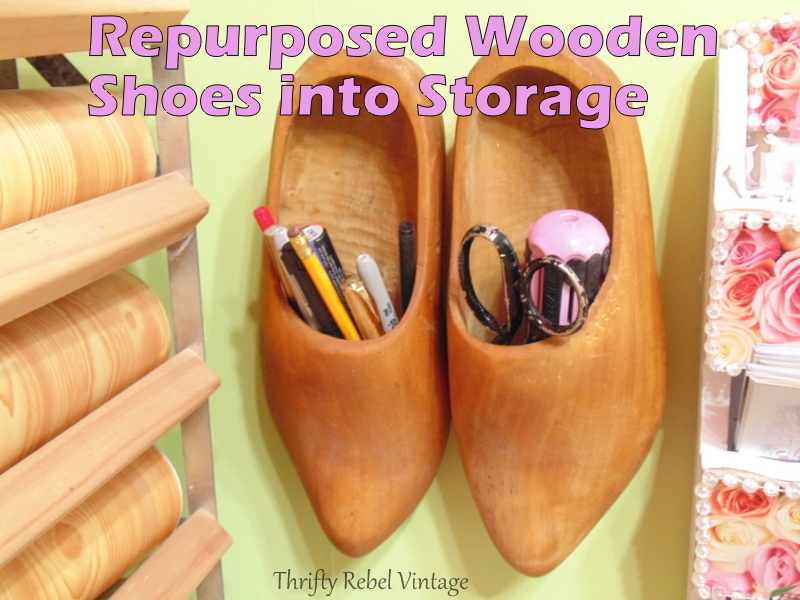 Now I don’t expect that you can just go out and find a pair of wooden shoes to hang on your wall, but look through your own stuff and see what unusual things you might be able to repurpose as cool storage. You might just be surprised by what you can come up with. More craft room projects coming soon… so stay tuned. Thanks so much for reading and until next time… keep on keepin’ on.. Recent related posts in case you missed them. Thanks Dona! I’m not sure you’d win that bet, but we’ll see. lol. I am anxious to get it done so I can move on with other things… like finishing my hallway that I started before this. It’s so easy to get sidetracked. lol. Wow! One will work. I’m in the putting back stage, but I sometimes feel that this reorganization thing will never end. There is an end in sight right? lol. For both of us I hope. Brilliant! I have some that were in my father in laws stuff…this is a fantastic idea! I was going to do a plant or something, but this idea is even better! Thanks Tina! I originally was going to use them as planters, but somehow I couldn’t bear the thought of getting their insides all wet and dirty. You don’t see these shoes everyday that’s for sure. How cool that you have some, and a family keepsake too. So funny and coincidental –guess what I did last night? Wait for it. 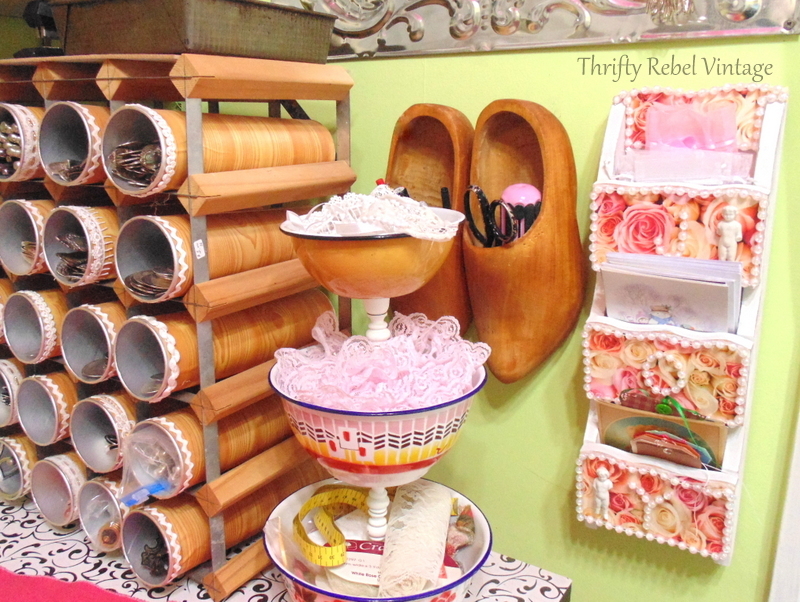 I reorganized my craft room! I had been making homeopathic bath products and that stuff was all over every surface. And I needed to find a place where all of the pieces/parts could live happily and CONVENIENTLY!! Mission was accomplished. And American Veterans Assoc. will reap the benefits!!! 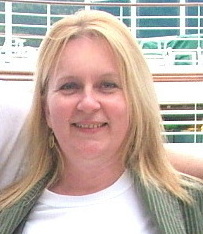 BTW–Love your blog, Tuula!! Thank you so much Gabi! That’s so sweet of you to say. I think many of us are taking this January to get our creative spaces back in order. It’s a good thing to do in the winter before the warm weather returns and we want to be outside again. I’m so glad you got your space all reorganized. Good for you! I know it always makes me feel better. I’m a big fan of natural handmade soaps and purchase them often… even when I’m on vacation. I just love them! Love it, you’re a very clever, creative lady Tuula! This is the cutest idea! Love it. Brilliant! I love this idea! Can’t wait to see more! Tuula, how creative!!! 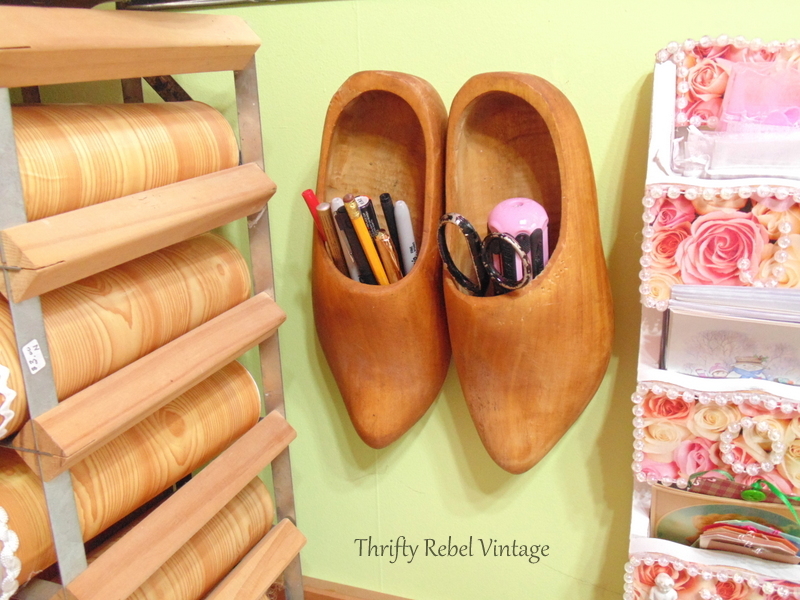 I love this storage solution using these wooden shoes!!! 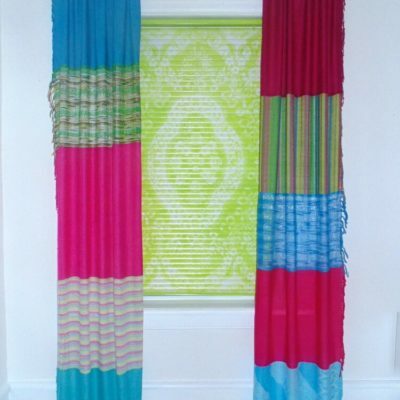 They look cool in your craft room! Very clever!! What a great, and cool storage idea! I like that it’s off your desk, but handy. You’re so ingenious. Thanks so much Sheila! I’m getting as much stuff off my desk as possible so I have a clean area to work with all the time. Hopefully I’ll keep it that way. lol. 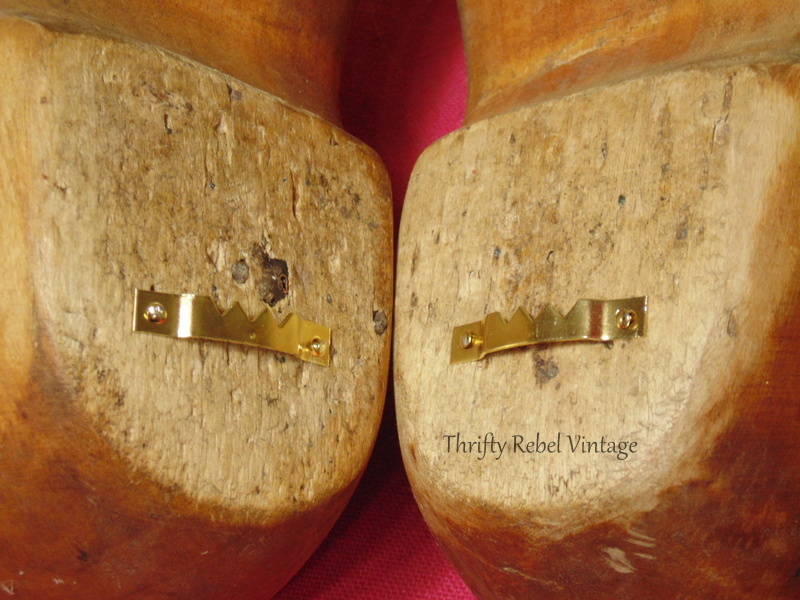 The wooden shoes are just so fabulous and I love how you repurposed them. They remind me of a huge one I had at my farmhouse that I actually hung on my front porch with the key behind it. Don’t have a clue where it is or if I even have it still. Yet another project for me….to find it! lol. Good luck with that search, but if you’re going through everything like I am you might just find it. I’ve found things hidden away in my craft room that I totally forgot about. Not sure if the problem’s my memory or my idea of safe places… probably both. lol. That is just the smartest thing I’ve seen. Love that it goes with the Pringle cans too. Thanks Karen! It was such a quick and easy project, and it’s kinda fun. I’ll never pass up a pair of wooden shoes again! What a clever repurposing idea! Thanks for sharing with us at Talk of the Town. These are the only shoes of this kind I’ve ever seen in person. I’m so glad I picked them up, even though I had no idea what I would do with them. Sometimes that actually works out in the end. lol. The wooden shoes are so cute. I agree what a creative idea to use them this way. Hey Tuula, what an excellent idea!! Thanks for sharing. That is just as cute as it can be! I’m currently also reorganizing my “craft area” and in addition to the mess, it’s dusty as I haven’t crafted in awhile! Thanks Jeannie! I think many of us crafters are organizing this month. I always get the bug after Christmas and it’s winter here so it’s a good time. Good luck with your reorganizing. I’m wondering if mine is ever going to end. lol. I love seeing this! So cute! I have a wooden shoe that has a rope through the back and I hang it on my door handle. It holds anything I need before I go and sometimes I empty my change into it. As for your cleaning and making a mess I had to laugh. Years ago when I was teaching my kids how to clean their rooms I told them “you have to make a mess to clean a mess.” Years later my youngest son repeated that back to me. I guess he was listening :D.
Ha! That’s too funny Kristyna. But it’s so true, and I’m doing a very good job of that. lol. I had never seen a wooden shoe in person until I found these, and I love them. That’s a cool use for yours. 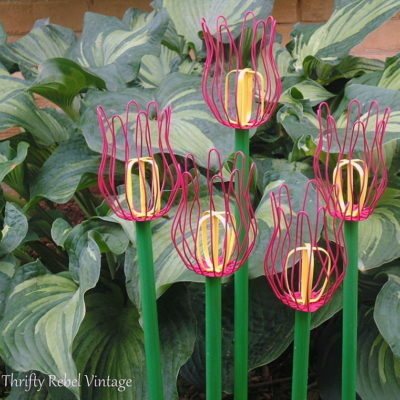 What a fantastic idea – this way they are not only decorative, they are useful…love your site btw!!! Thank you so much! I do love my shoes. I totally understand about having to clear off the workbench before you begin a project. I really need to do a total organization of my workspace and you have inspired me. Thanks so much Carol! Good luck with your workspace. Thankfully I’m almost finished mine. It’s always fun to join the party. How awesome are these??? So cool- and seriously unique! Thanks for bringing your A-game to Talk of the Town! You are so clever Tuula–so fun and yet so functional at the same time 🙂 Thanks for sharing your idea with us at Vintage Charm! Thanks Diana! I have to say that I really love my shoes. I have to admit I’ve never, ever seen this anywhere else. Too stinkin’ cute! Great job. I love your ideas! We are kindred spirits 🙂 I began recycling Pringle cans years ago for my classroom and they have worked very well. Upcycled a wine rack for vinyl storage. Using thrift store coffee pod holders to organize small items, and a Spice Stack to get my washi tape under control. Upcycling and repurposing are wonderful ways to save money and find a new purpose for something that would have gone to landfill. Love the pix of your organizing treasures. I would love to get hold of a stash of pringles cans; I already have too many snack foods I love to start collecting my own! Using treasures to organize your stuff is so much less antiseptic that using just plastic storage shelves, drawers, cups. I think that is how a creative space should be! Thanks Kathy! I hope you can find someone else who loves Pringles and maybe they can save the cans for you. I use them in the kitchen as well for holding different pastas. Spaghetti fits just perfectly. I try to use as little plastic as I can, and I love using the things that I collect in a practical and fun way.